This impressive Lumberjack Cake was created by Elizabeth Marek of Artisan Cake Company of Portland, Oregon, and author of Visual Guide to Cake Decorating. Another of her works of art is the Lumberjack Cake, inspired by her husband, who chopped down their Christmas tree in a lumberjack jacket. Jenny Keller of Jenny Cookies Bakeshop in Lake Stevens, Washington took up the cause and created an entire lumberjack party. Every part of the cake is edible: The bark is made from chocolate, the axe is made from fondant. To both artists: Thank you for this most enjoyable bit of food fun. If you want to try your hand at honoring your favorite lumberjack, you can buy the tutorial ($15). Also scroll down that page to see the lumberjack wedding cake. For more cake pleasure, take a look at our Cake Glossary: the different types of cake, beginning with a brief history of cake. You may also enjoy the history of cake pans. And let’s not forget the history of the oven, and give thanks to all the bakers who labored under challenging conditions to create cakes that were attractive and delicious. 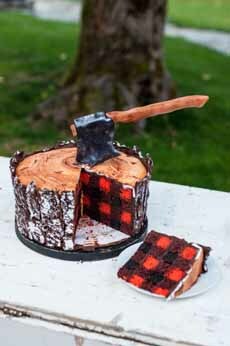 We don’t know any lumberjacks, but we want this cake! Photo courtesy Jenny Keller | Jenny Cookies Bakeshop. Now how did they keep the bottoms of the cakes from sticking and burning, in the many centuries before the invention of the cake pan and the temperature-controlled oven—and long before silicone oven gloves?